On Monday, February 27, the Foundation presented to the District Board of Trustees a gift of $22,700 to benefit Educator Preparation Institute scholarships. Polk State is extremely fortunate to have employees who go above and beyond their daily duties to help students succeed. Beverly Woolery and Sherri Davis with the institute are a shining example of employees who go beyond. When an opportunity presented itself to have respected leaders in the education industry speak in our community for the last two years, Beverly and Sherri had the brilliant idea to make it a win-win engagement – strengthen the skills of current and aspiring teachers and raise scholarship funds for students in the Educator Preparation Institute, also known as EPI. This program is a competency-based certification program that offers a state-approved pathway to a five-year Florida Professional Teaching Certificate. Applicants must hold a bachelor’s degree in any discipline from a regionally-accredited college or university. Through the Institute, candidates with bachelors’ degrees in any discipline can receive teacher certification, giving them the skills to become highly-qualified educators in a fraction of the time and cost required for a traditional education degree. Teacher Candidates can complete the program and required exams in less than 6 months. 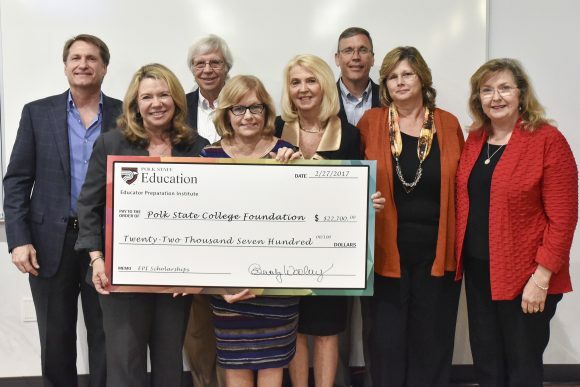 Beverly and Sherri, we are most grateful for your idea of bringing these renowned speakers to Polk to benefit all teachers in our county and all of the hard work you put in to generate these important scholarship funds that will help Polk State EPI students to succeed.